The growing variety and complexity of marine research and application oriented tasks requires unmanned surface vehicles (USVs) to operate fully autonomously over long time horizons even in environments with significant civilian traffic. In order to address this challenge, we have developed a lattice-based 5D trajectory planner for USVs. The planner estimates collision risk and reasons about the availability of contingency maneuvers to counteract unpredictable behaviors of civilian vessels. The planner also incorporates avoidance behaviors of the vessels into the search for a dynamically feasible trajectory to minimize collision risk. In order to be computationally efficient, it dynamically scales the control action primitives of a trajectory based on the distribution and concentration of civilian vessels while preserving the dynamical feasibility of the primitives. We present a novel congestion metric to compare the complexity of different scenarios when evaluating the performance of the planner. Our results demonstrate that the basic version of the risk and contingency-aware planner (RCAP) significantly decreases the number of collisions compared to a baseline, velocity obstacles based planner, especially in complex scenarios with a high number of civilian vessels. The adaptive version of the planner (A-RCAP) improves the computational performance of RCAP by 500 %. This leads to a high replanning rate, which allows shorter traversal distances and smaller arrival times, while ensuring comparable incidence of collisions. This work was supported by the Office of Naval Research under Grants N000141110423 and N000141210502 and National Science Foundation under grants IIS1526487 and IIS1526016. Opinions expressed in this paper are those of the authors and do not necessarily reflect opinions of the sponsors. Fulgenzi, C., Spalanzani, A., Laugier, C., & Tay, C. (2010). Risk based motion planning and navigation in uncertain dynamic environment. Research report. https://hal.inria.fr/inria-00526601. LaValle, S. M. (2006). Planning algorithms. Cambridge: Cambridge University Press. http://planning.cs.uiuc.edu. Švec, P., Schwartz, M., Thakur, A., & Gupta, S. K. (2011). Trajectory planning with look-ahead for unmanned sea surface vehicles to handle environmental disturbances. 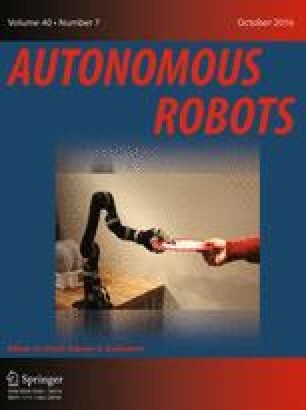 In IEEE/RSJ international conference on intelligent robots and systems (IROS 2011). doi: 10.1109/IROS.2010.5650385.